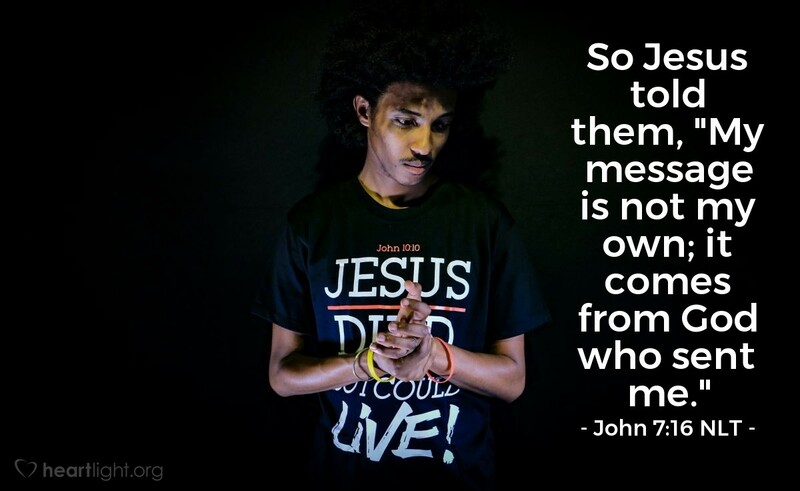 So Jesus told them, "My message is not my own; it comes from God who sent me." Jesus wants all of us, including those who would reject him, to know that his words do not find their origin in a man's opinion. His words come from God! Jesus is more than a prophet. He is more than a teacher. We had better not discount him because we know where he was born or that he didn't have a formal education. His message is divine. His ideas are heaven-sent. What we do with Jesus is what we decide about God! Almighty God, I thank you for revealing yourself to me in Jesus. Thank you for speaking your words of truth through your Son. Help me as I seek both to understand and to obey Jesus' words and to honor your will. Transform me to be more like your Son as I seek to honor his words in my lifestyle. In Jesus' name, I pray. Amen.